In an earlier post, I talked about what happens when neurons “fire”. When something important happens, electrical impulses travel down the axons of neurons in what is called an action potential. But what happens when the message gets to the end of the axon? Does it just flutter off into the vacuum of brain space? Of course not! The message transmits to the next neuron in line. If you see something you want to grab, your neurons need to talk to each other: a neuron in your eyes needs to talk to a neuron in the brain’s visual cortex which talks to a neuron in the brain’s motor cortex which talks to a neuron in your muscles. Except that a lot more than four neurons are chatting to each other. Thousands are. How do they all connect? Enter the synapse. This is the connection point between the axon of one neuron and the dendrites of another. Zooming in on neurons and synapses. Picture from http://www.laboguyrouleau.ca/S2D.html, arrows are my own. The synapse is a HUGE topic. Why? Because this is where everything happens. Personality, memory, mood, it’s all encoded here, in these tiny little synapses, thousands of which stud a single dendritic tree. (Not sure what I mean by “dendritic tree”? Check here). For two neurons to talk to each other, they have to have some way to communicate. Humans use words to communicate. Dogs bark. Bees dance. Birds sing. Neurons communicate with neurotransmitters. Neurotransmitters are chemicals, but you can think of them as the words that neurons use to talk to each other. Just like words, there are lots of neurotransmitters, and each one has a special meaning. Some cause you to feel specific emotions, like happiness or sadness. Some help you learn. Others move your muscles or make you feel sleepy. 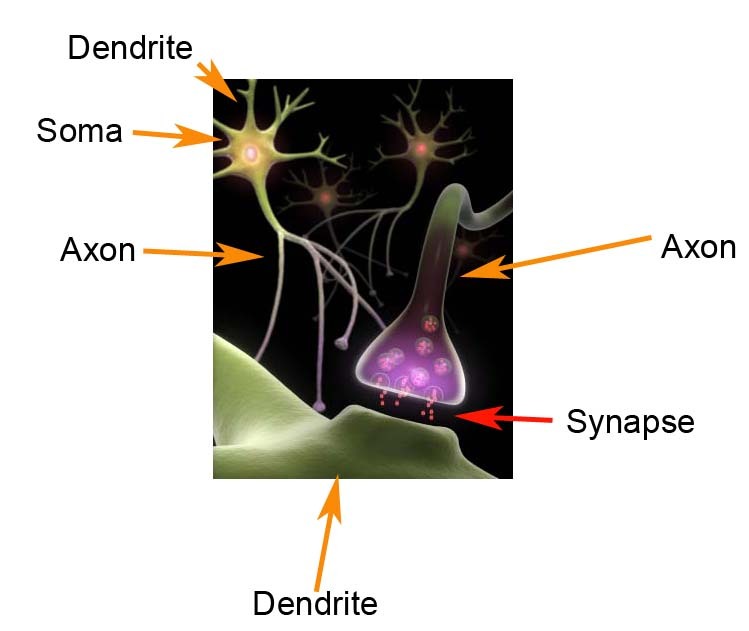 When an action potential reaches the end of an axon, the axon releases a neurotransmitter, which is received by the dendrite. I’ll talk about how this happens in a later post. Until then, think of the axon as waving down the dendrite, then shouting a bunch of words over and over until the dendrite gets the message. A neurotransmitter "word." This is serotonin. DOPAMINE: This causes feelings of pleasure and reward. 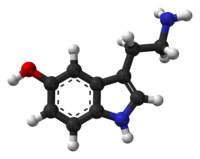 Addiction results from imbalances in dopamine levels. SEROTONIN: Another “happy” chemical. If you don’t have enough serotonin, you feel sad and depressed. GLUTAMATE: This one is responsible for learning and memory. ACETYLCHOLINE: (Say: a-see-til-koh-leen) This chemical makes your muscles move. Snake venom works by preventing your muscles from recognizing acetylcholine. This causes paralysis and, if you don’t get to a hospital quickly, death. ADENOSINE: Too much of this and you get nice and sleepy. When you wake up, adenosine levels in the brain are low, but they increase during the day until you just can’t keep your eyes open anymore and crash into your bed at night. The caffeine in coffee or soda works in part by making your neurons unable to respond to adenosine.